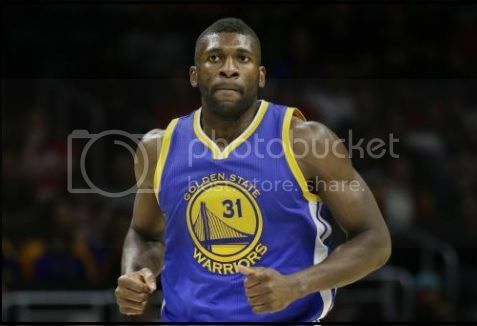 July 7, 2016 -- Free agent center Festus Ezeli has agreed to a two-year contract with the Trail Blazers. According to Adrian Wojnarowski of The Vertical, the deal is worth $16 over the two years. Ezeli arrived in Portland last night to meet with Portland Trail Blazers representatives regarding a possible signing with the team. The news of the visit, reported first by CSNNW's Jason Quick, comes as the Blazers are continuously looking for a defensive minded center. Ezeli reportedly told Quick that he is considering a number of other teams as well. He is in Portland on a "one-way ticket" and unsure of how long he will be there. In addition to meeting with the organization, he is also scheduled to take a physical. Ezeli, who played his first three seasons with the Golden St. Warriors, is an unrestricted free agent whose rights were renounced by the Warriors as they were forced to clear cap space by their signing of free agent Kevin Durant of the Oklahoma City Thunder. Ezeli, 6'11 and 265 pounds, had corrective surgery on both knees a couple years ago, but told Quick today that they feel great now. Over three seasons, Ezeli has appeared in 170 games with 61 starts. He has averaged 4.2 points, 4.3 rebounds and 1.0 blocks in 14.1 minutes per game over that span. He posted career bests of 7.0 points, 5.6 rebounds and 1.1 blocks in 16.7 minutes last season. A four year player at Vanderbilt, Ezeli averaged 7.7 points, 4.5 rebounds and 1.7 blocks over his collegiate career. He finished college as Vanderbilt's all-time leader in blocked shots with 204. He was selected by the Warriors with the final pick (30th) of the first round of the 2012 NBA Draft. Now that the Blazers have agreed to terms with Ezeli, they would still have three restricted free agents to consider bringing back in forward/guard Allen Crabbe, center Myers Leonard and forward Maurice Harkless. The feeling is that the team would keep two of them. Crabbe was reported to have a meeting with the Brooklyn Nets. this could be an interesting fit. the question is: can he take the next step in his career with the Blazers? i can see a bust or maybe another Robin Lopez type of player. I'm glad we didn't spend too much for him. I think he can help us a lot. Nice signing.